This week’s choice is a number one instrumental named after a bird, the albatross, which is mentioned in the classic poem The Rhyme of the Ancient Mariner by Samuel Coleridge. As a child Peter Green, guitarist and singer with Fleetwood Mac read the poem and it gave him the inspiration he needed for the song. DJ Tony Blackburn once said this classic “It’s the most crushingly boring tune in the world. It just drones on. It starts, then it continues and then doesn’t go anywhere.” Many people have probably said that of Tony Blackburn. Some sources state that Santo & Johnny’s 1959 track Sleepwalk became an inspiration but it bears much more than a passing resemblance to a Chuck Berry 1957 instrumental called Deep Feeling which has many of the same elements including a call and answer style of guitar playing, and the permanent bass in the background. Chuck made no attempts to sue for plagiarism as Deep Feeling was, in turn, based on the 1939 country-tinged, Floyd’s Guitar Blues by Andy Kirk & his 12 Clouds Of Joy. The tracks in feel gives the effect of a calm sea and an airy breeze. Green only used four chords and Fleetwood only used timpani mallets so as not give it a heavy drum sound. 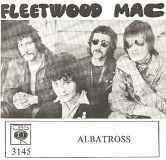 Fleetwood Mac were formed in 1967 and comprised Peter Green, Mick Fleetwood, John McVie and Jeremy Spencer. In August 1968, another lead guitarist, Danny Kirwin, was drafted in to give the group a jazzier feel. Although not evident on Albatross he is prominently featured on the B-side Jigsaw Puzzle Blues. By 1970 Peter Green’s health was failing following his involvement with LSD and both he and Spencer quit. With various personnel changes including Stevie Nicks, Christine Perfect (later McVie) and Lindsey Buckingham, the group were elevated to supergroup status during the seventies and eighties. Musically, Albatross inspired the Beatles song Sun King which appeared on their 1969 Abbey Road album. In 2005 Marks and Spencer used it for one of their television adverts.